Today I sketched another bespoke EdinburghSketcher avatar. Only £10 from the ES shop you simply send me your photograph and I’ll sketch it and send back the avatar usually within 24 hours. At 200 pixels square it’s the perfect size for twitter, facebook and all your social media sites, so head over to the shop and order one today. 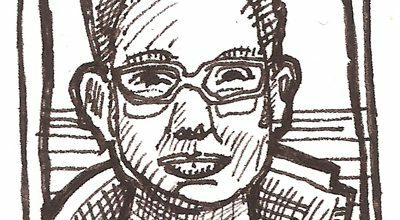 Would you pay £10 for a EdinburghSketcher personal avatar? You can use it for all your social media sites and general online presence, and all you have to do is deposit the readies into my paypal account and send me a photo, easy as that. A proud brother and his newborn sibling. A simple black and white sketch captures just enough detail to show the viewer a beautiful moment in time. An A4 illustration like this one costs £65 mono and £78 in colour. If you are interested in ordering an EdinburghSketcher original then please get in touch HERE to talk it over. Be sure to head down there early to grab the comfy chairs by the fire! Although I never met Barney I wish I had he looks full of energy. Rest in peace pal. I’m glad I was disciplined last night and worked on a couple of commissions, so no more today. A close up of the dog portrait I was working on at the weekend, four jack russels running on a beach.